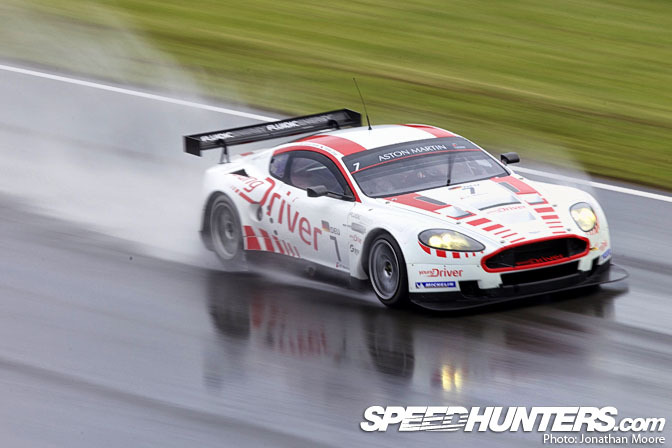 There's been a growing association in my mind between the GT1 events so far this years and colours. Abu Dhabi? Blue. The bright sky, the run-off strips and Yas hotel. Silverstone? Brown. Mud. Gravel. But Brno? Brno is verdant green. Green is the grass, green is the lush forest that the track sits in the middle of. It makes for great backgrounds for the cars, and means the deep howls of the cars reverberate around long after they've passed by. It's a beautiful track: with massive elevation changes and lots of challenging corner combinations. 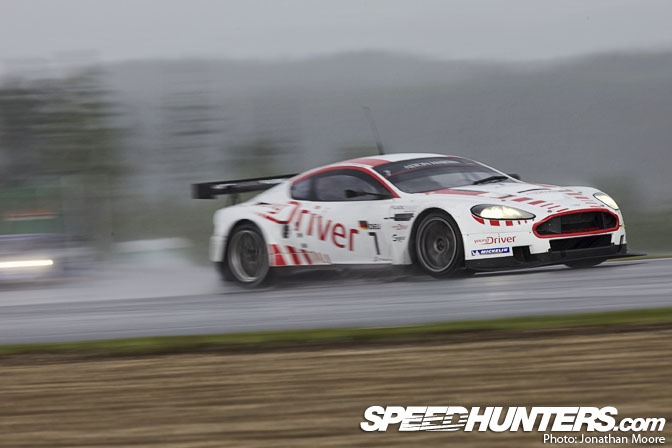 The drivers love it and it's great for spectators. 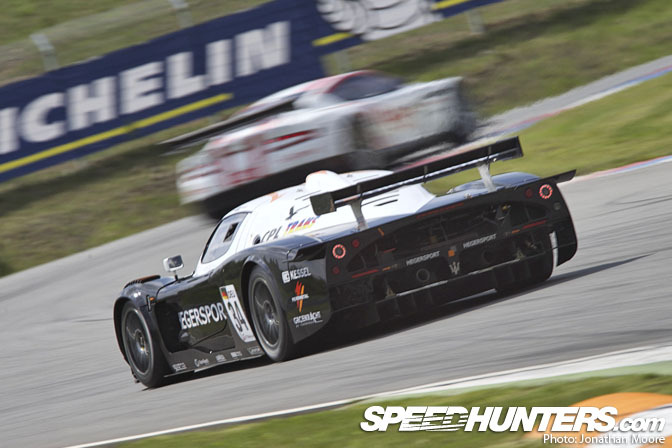 In an FIA GT event weekend, the packed schedule has all classes practising on the first day, followed by morning qualifying and the first races in the afternoon of the second. There are limited engines that teams can use over a year, but all the counts have been reset to zero from Brno because of ECU problems in the first two rounds: most teams have suffered (except Maserati, it would appear…), and some more than others. Corvette, for instance, will really benefit from this amnesty. However, Engines going bang is one thing. Some engines are made to go on fire. 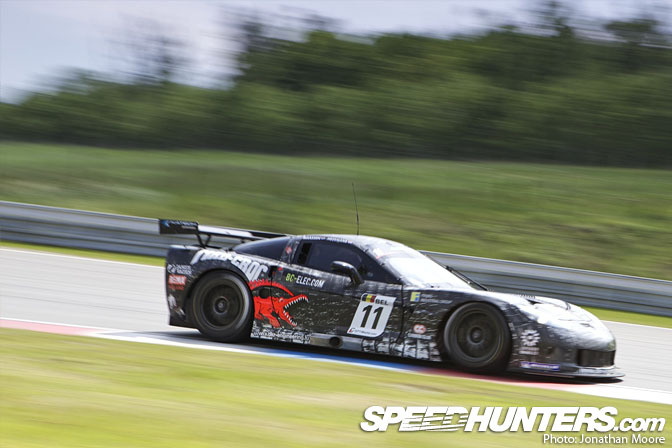 Which of course, is another excuse for a shot that you can see everyone round the track gunning for: the Flaming Lambo Special. 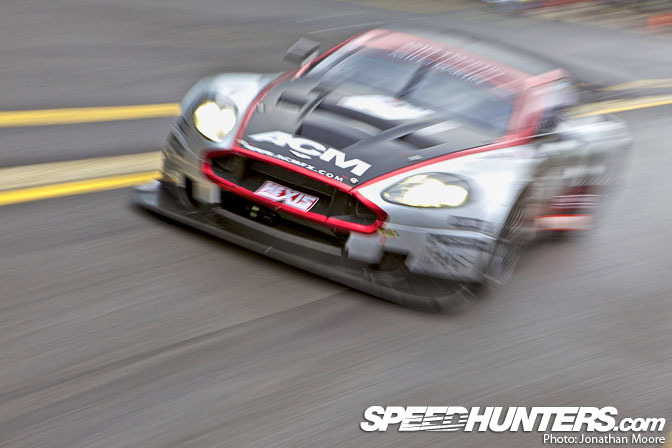 There's a smattering of new drivers across the grid, but the highest profile addition is Stéphane Sarrazin joining race winner Fréderic Makowiecki in the #9 Hexis Aston Martin DB9. 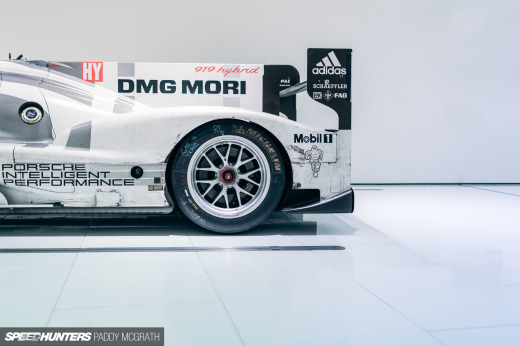 His addition means there are now six current GT1 drivers who are ex-F1, Enrique Bernoldi, Karl Wendlinger, Mika Salo, Romain Grosjean and Tomas Enge being the others. Sarrazin only started one Grand Prix, for Minardi, but has had a wide and varied career. 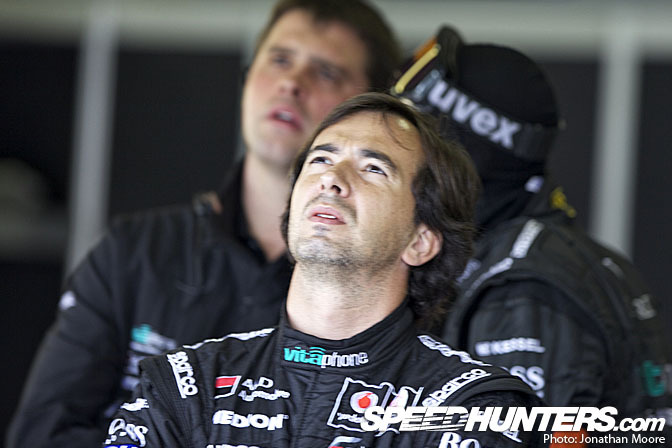 He tested in F1 for Prost and Toyota, competed in the World Rally Championship in a Subaru Impreza in 2004 (he still regularly enters the Monte Carlo rally) and has plenty of sportscar experience on his CV, including a Le Mans Series title for Peugeot in 2007 and several podium places at Le Mans. 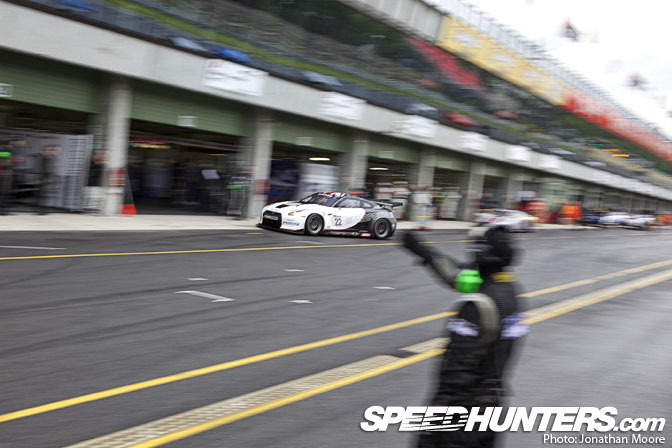 With the first Free Practice session of the weekend for GT1 at 9am, it meant getting to the track for 7am and a snatched breakfast at the track for the Sumo Power crew. Then, straight into the garage to carry on working on set-up and practising those all-important pit-stops. As usual, when the session start time drew near the cars were pushed out into the pit-lane and manoeuvred line-astern down the pit-lane. So far there's been a bit of moving around of the teams as far as pit garage position is concerned, but all the four cars of each manufacturer always stay together. Ignitions on, and then final checks by the mechanics as the engineers waited to send the cars out. After the initial rush to get out, the few remaining cars made their way out. Even on the limiter, they're still plenty fast. 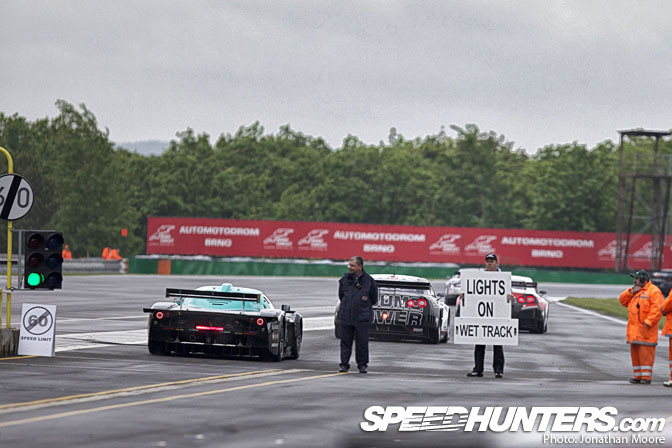 A hooter sounds every time a car enters the pit-lane, but there's no warning for cars leaving garages. You have to keep your wits about you and stick to either the safety of the pit-wall or up hard against the garages. Getting in the way of a car is the quickest way to get thrown out of the pit-lane if you're lucky, or end up in hospital if you're not. Out on the track the cars quickly got up to speed: though for all their pretty looks, the Lamborghinis were really struggling here. Both cars were at the bottom end of the time sheets come the end of the session. 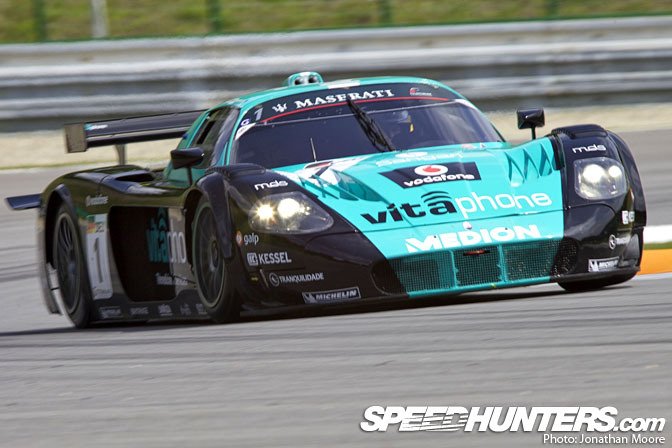 On the other hand the Vitaphone Maseratis were looking ominously quick: they've always been fast at Brno. 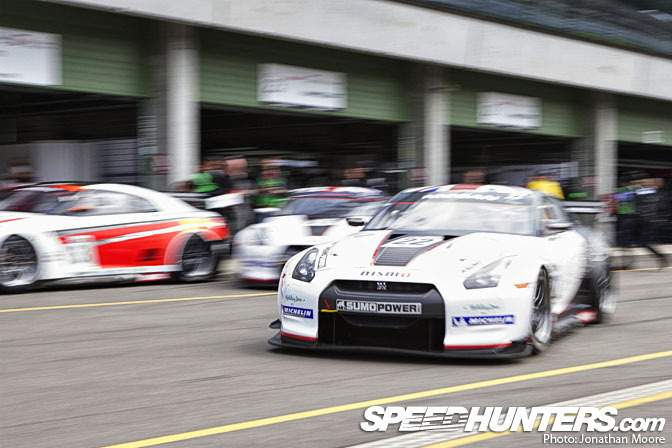 Also, Sumo Power's #23 GT-R of Michael Krumm and Peter Dumbreck scored an impressive second-fastest time: the team's hopes are really resting on that car, as the #22 car has been saddled with 40kg of success ballast after its Silverstone victory. With the heavy downhill braking sections and uphill slog to the finish, the extra weight will be a real handicap. 2pm. Time for the unnecessarily-named Pre-Qualifying session. 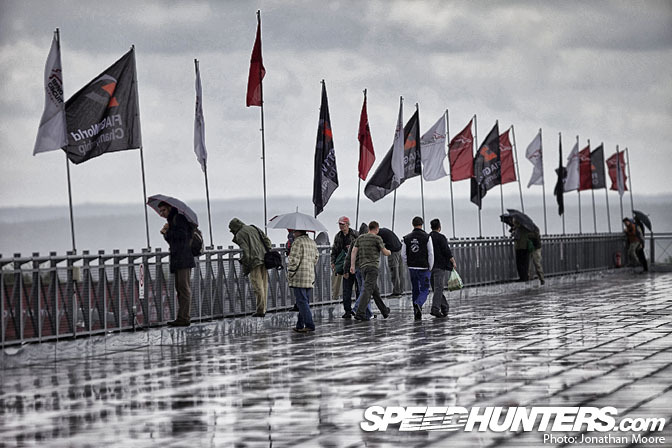 Despite the weather, some hardy spectators had made their way onto the viewing terrace atop the pit building. It's a great place to spectate if you can get access, as not only can you see the whole pit-straight, but you can also look straight down into the pit-lane. Unlike earlier, now it really was properly wet. As usual cars often made a single initial run to check the car over before diving back into the pits. 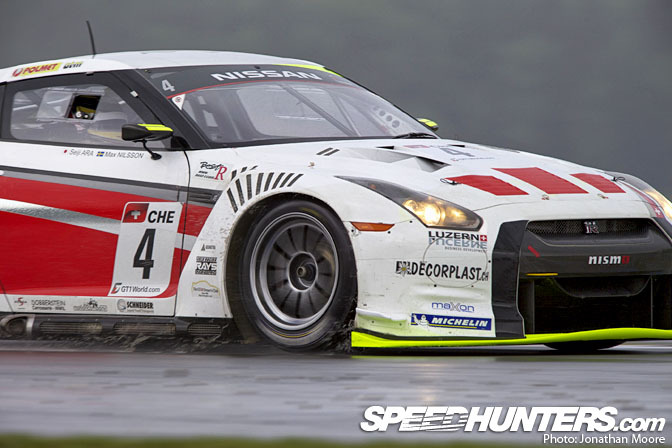 It shows how hard the brakes work over even a single lap: check out the smoking brakes on the SRT Nissan GT-Rs. 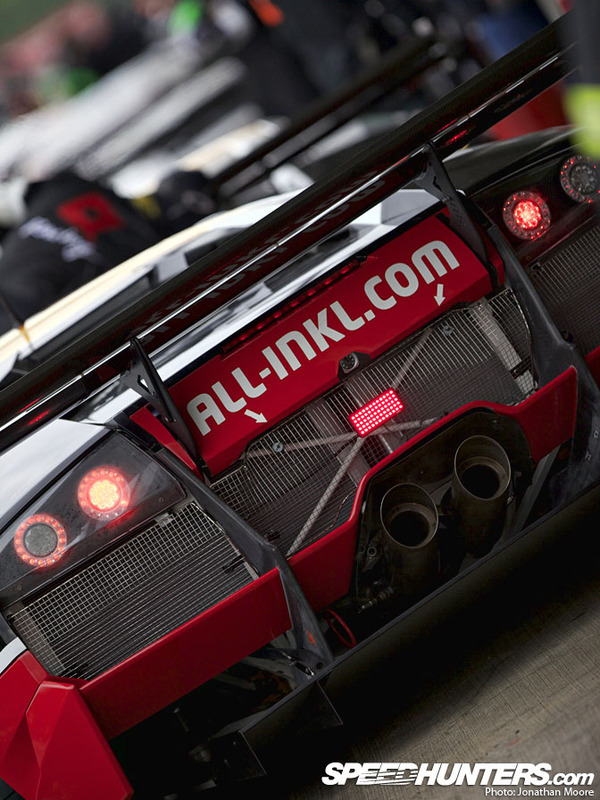 It was a fraught start to the session for the All-Inkl Lamborghini team: after receiving two warnings for not having its lights on, the #38 Murcielago spun into the gravel at turn 11, right at the bottom end of the circuit, but recovered to the track. But just a lap later, the #37 sister Murcielago was in the same gravel, but beached: this caused a brief red flag whilst the car was recovered. After a quick clean-up in the garage it was back out on track. 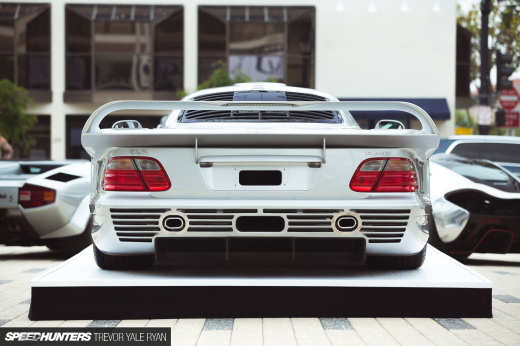 Cars splashed down the straights, throwing up great rooster tails of spray. Times were pretty irrelevant, as cars tip-toed around trying to find grip and searching out lines. 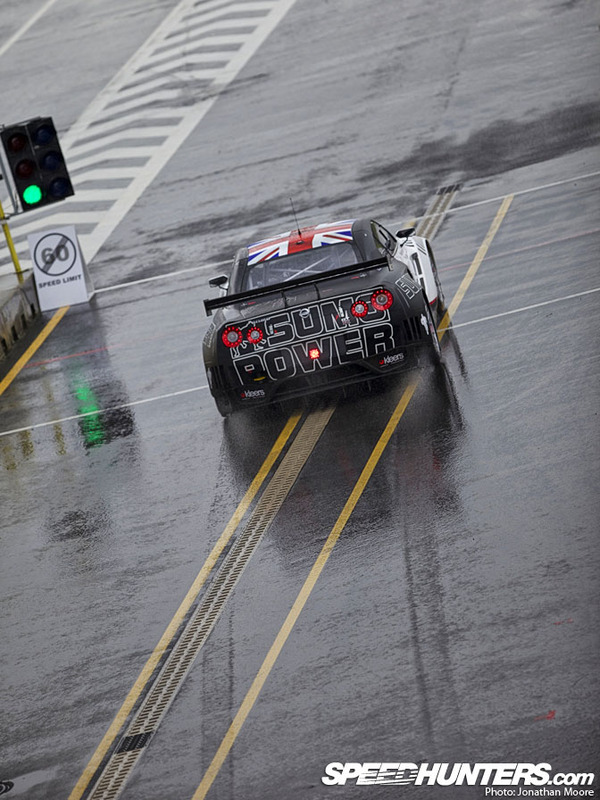 Laps were 20 seconds off dry pace, but with the weather forecast looking like it would continue in the same vein over the weekend all the drivers needed to get wet track running under their belts. But the schizophrenic weather continued. 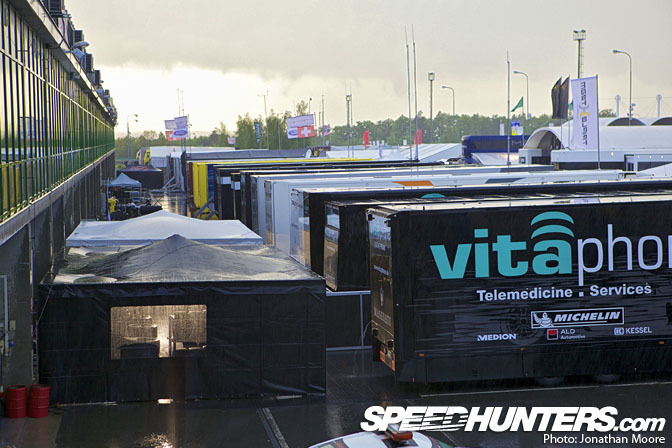 Despite the track still being soaked, the sun started blazing down – so, off with the wet-weather gear and camera rain covers and down to a t-shirt. This – and the reverse – would become a familiar process. 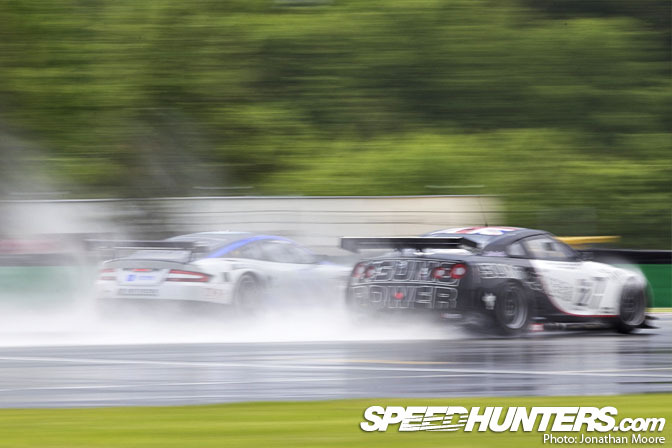 Of course, along with keeping the car on the track, drivers are also trying to see where the other cars are amongst all the water that's thrown up: this is the #22 Sumo Power GT-R winning a damp drag race down the start-straight. The second half of the track includes the long drag up the steep hill to the finish: there are two reasonably long straights with tight left-right uphill flicks. Once they get to the top of the hill they break out of the forest for a moment and onto a plateau: you can see for miles in the distance, all the way over the Brno town. The local countryside is really quite hilly: very different terrain from the first two tracks GT1 has visited this year. At the end of the session it was the #40 Marc VDS Ford GT on top: but those pesky Vitaphone Maseratis were only just behind in third and fourth. 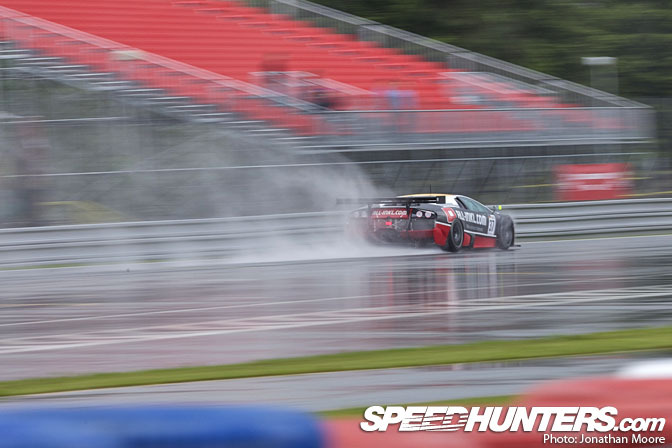 The wet conditions seemed to help veteran Peter Kox get the most of the Lamborghini: he pushed up to sixth place. 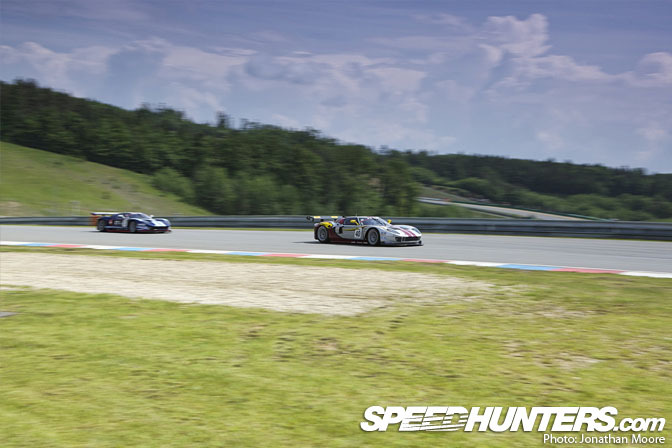 In between the GT1 sessions were the European GT3 (with 'our' Team Need For Speed BMW Z4), the Italian Porsche Carrera Cup and Lamborghini Super Trofeo series, so the track was constantly busy – I'll give those some coverage separately. Come the evening, and the rain had started again… what would it do tomorrow? Well, luckily there were some distractions from the weather on Saturday morning, For some reason a parade of grid girls seemed to be wandering up and down the back of the pit garages. Thankfully team personnel have the focus to get on with their jobs, of course. Unlike photographers. 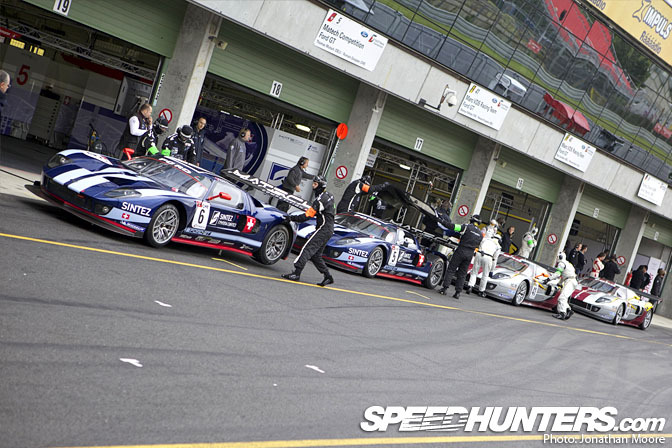 And they have to: for instance, on top of all the car preparation and running, there are plenty of rules in GT1 that need to be adhered to. 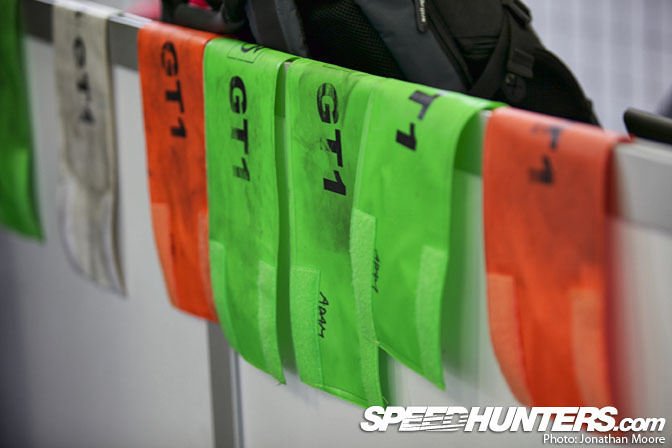 Only two tyre-changers are allowed per car: coloured arm-bands have to be worn during pit-stops to make it clear which car you're assigned to. Lose one and you get a hefty fine to replace it. The first session on day two is qualifying. This is qualifying that sets the grid for the Qualifying Race that will set the grid for the main Championship race the day after… Time for that dance once again: cars pushed out onto the pit-lane and arranged nose-to-tail. 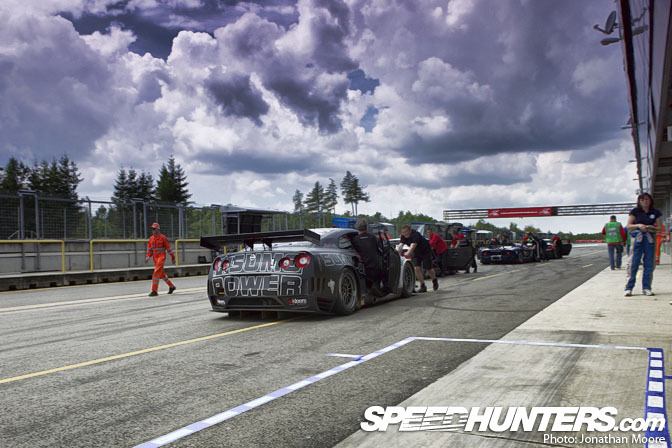 The confines of the pit-lane mean that often you have to wait for the car in front to go before you can. Sumo Power kept their cars at slight angle, and sent them out pretty much immediately as soon as the lights turn green. This time it was the Marc VDS team that hung back, its two Ford GTs waiting in the pits with the drivers fidgeting with dash settings. 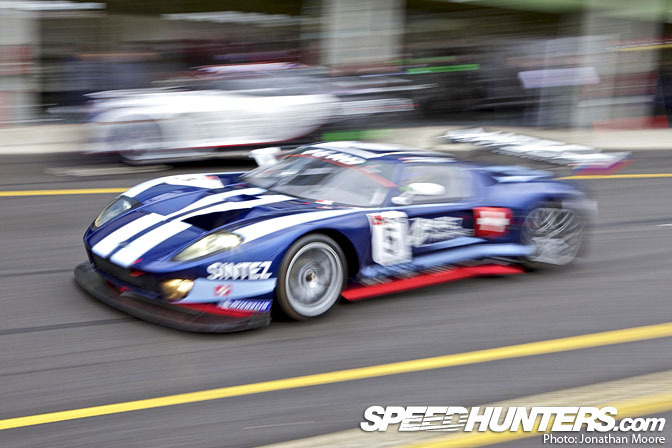 GT1 uses a knock-out qualifying system that removes the slowest third of the grid at the end of each of the three sessions. In the first 20 minute session, the #1 MC12 was fastest on 1:57.156, with the #7 Aston Martin and #23 Sumo Power GT close behind: there was less than a second between first and 12th. 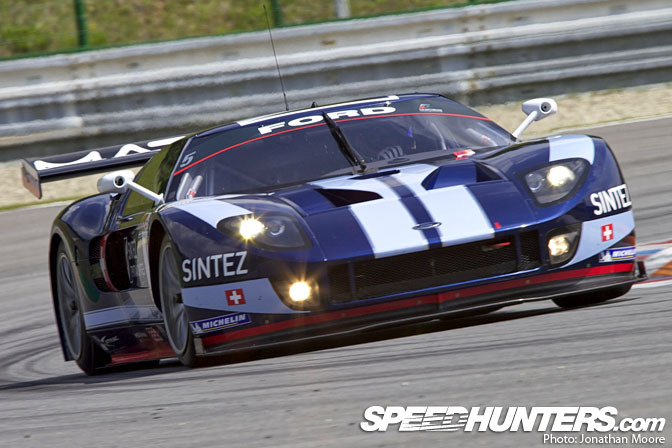 With the bottom seven knocked out (due to the no-show of the #14 Corvette), this meant that the all-girl #6 Matech Ford GT, both Reiter Lamborghinis, Sumo Power's #22 and SRT's #4 Nissan GT-Rs, the #37 All-Inkl Murcielago and the #41 Marc VDS Ford GT were all casualties. In the second session, the #1 Vitaphone Maserati was once again just fastest, this time with the #11 Mad Croc Corvette and the sister Vitaphone MC12 behind. Dropped this time were Mika Salo's #12 Mad Croc and the #13 Phoenix/Carsport 'Vettes, SRT's #3 Nissan, the #8 Young Driver and both Hexis Aston Martins, the #34 Triple-H Maserati and #5 Matech Ford GT. Winners in Abu Dhabi, the Ford of Romain Grosjean and Thomas Mutsch has been caught and overtaken by the other teams with the latest Balance Of Performance changes. Bad luck at Silverstone didn't help their cause. It's always a nervous time back in the pits as the time counts down. Here Miguel Ramos of the #2 Vitaphone squad watches the timing screens to check on the progress of his team-mate, Enrique Bernoldi. 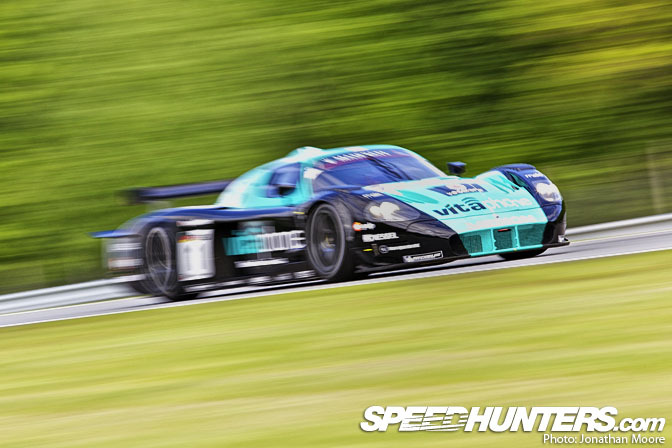 Into the final session: the Vitaphone cars hammered round and swept the top two spots with laps in the 1:55s. 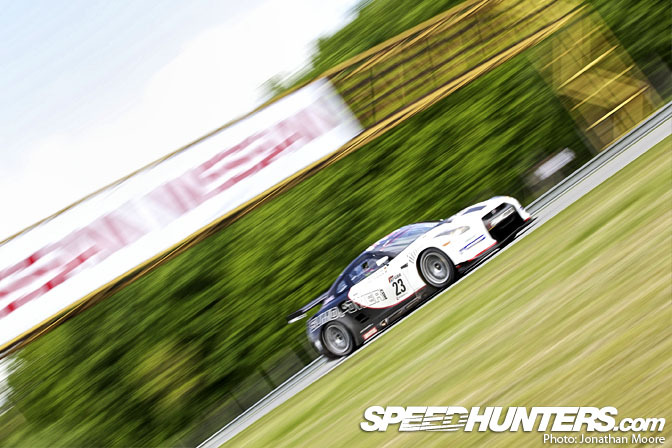 Local hero Tomas Enge and Brit Darren Turner bagged third in the #7 Aston Martin with a 1:56.304 and Sumo Power's un-ballasted #23 GT-R of Michael Krumm and Peter Dumbreck managed a fine fourth, just 8/100s of a second behind the #7. Leinders and Maxime in #40 showed their wet time was no fluke by leaving their Ford team-mates behind and qualifying eighth. 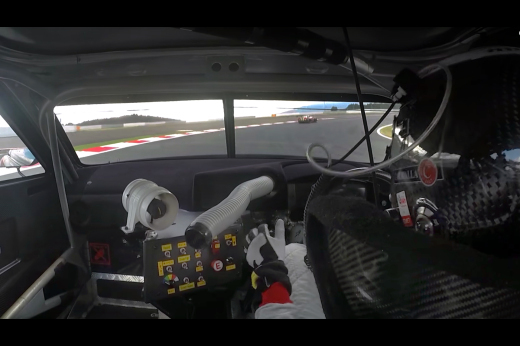 Similarly, the #38 Murcielago of Nicky Pastorelli and Dominik Schwager made it through to the final part of qualifying, ending up a creditable sixth. Not bad when you consider all their sister cars were back between 19th and 22nd. As soon as qualifying was over, all cars were put under Parc Fermé conditions and had to be pushed all the way down to the scrutineering garages right down by the last corner. The morning's work was over for the drivers, but the afternoon would see the rolling start of the hour-long qualifying race. Time for the racing to start! the shot of the flaming exhaust....awesome....seriously loving the distraction shot...ahem...of the grid girls lol.